Today’s recipe is a simple, yet scrumptious method of preparing shrimp. It’s a great weeknight meal because it only takes about 5 minutes to prepare and then 15 minutes to cook. The panko crumb coating on the top of the shrimp gives a perfect crunchiness to this dish. It’s almost like you get the crispy texture of breaded shrimp without all the work. The garlic and the white wine add so much flavor! With only a handful of very common ingredients, this recipe is great for staying on a budget. Now I personally (due to my tight grocery budget) purchased frozen shrimp. Let me just say that frozen shrimp works just fine. If “just fine” is good enough for you, and you need to stay on a budget, then by golly go buy you some frozen shrimp! But if you don’t mind spending a little extra or you’re really looking for a higher quality seafood taste, then the fresh is certainly the better route. To me, the frozen shrimp just has a bit of a rubbery chewiness to it, BUT the taste is still good, and the price is even better. So I usually go with frozen unless it’s for a special occasion or guests or something. Transfer dish to oven and bake until the shrimp are pink and opaque, about 12 minutes. Love this one! Served it with Garlic and Olive Oil Vermicelli Pasta Roni. ok I have a question…all that’s in the sauce is wine and butter…is this not dry or is it just right??? I’m going to give this a try..sounds yummy! It’s just right! It’s got a crispy texture so it’s not supposed to be super moist The wine and butter are more for flavoring. Did you defrost the frozen shrimp first? Yes defrost them first Hope you enjoy it! Tail-on annoys me too because I hate getting my hands greasy but it’s for good reason…it helps with the flavoring of the dish. The shrimp retain more flavor that way. Just crack it down the middle and slide off instead of tearing the tail off. It’s no reason to lose any meat! Hello! I have frozen pre cooked shrimp I’m looking to get rid of this week. Would pre-cooked work here or would it just be a gross, rubbery mess? If ok, should I just reduce the baking time? Thanks!!! You can definitely still use those! In fact, I’ve accidentally purchased pre-cooked shrimp before and just had to make do To be honest, there is a little bit of a rubbery texture, but it’s really not too bad (my husband didn’t even notice), and the flavor is still good I would cut the baking time about in half. I have everything but the white wine, is there a substitute? Rice vinegar is almost the same thing so you could use that If you don’t have that either try white grape juice or chicken broth Hope this helps! Julia Child always kept dry vermouth on hand. doesn’t go bad like wine does and substitutes easliy…. Can you use regular bread crumbs instead? Regular bread crumbs don’t really have the same crispiness that panko does A better substitute would probably be crushed crackers or maybe even crushed cornflakes Let me know what you end up using and how it turns out! Thanks for the tip Cyndi! So I made the shrimp last night and I wound up using the regular bread crumbs… It didn’t turn out crispy but the hubby and I still loved it! Thanks for posting the recipe I feel like I’m constantly making the same thing. Being that I’m a working mom I’m always looking for quick/easy things to make. do you have any suggestions for people who don’t like parsley? can i just leave it out or is there an appropriate substitute? thanks for this recipe, so excited to try it tonight! Honestly, the parsley doesn’t add that much flavor so you could just leave it out It’s mostly just for visual appeal However, if you have some Italian seasoning, that would be good on this as well! I don’t cook with wine…what kind of white wine would you use? Any suggestions? Thank You! Chicken broth is a fairly good substitute! You could also try white grape juice. I definitely am going to make this!! The pasta that is shown with the chicken looks delish as well, do you have the recipe? Haha sure you can! It’s called Suddenly Salad pasta salad mix 🙂 Easy right? They have lots of different kinds but I think this one is tomato pesto or something like that In my grocery store, it’s in the salad dressing aisle. Thank you Danesha! I’m so glad you liked it! How many calories is this with all of that butter? I made this last night and it was DELICIOUS! I served it over seasoned angel hair pasta. I sauteed a clove of garlic, red pepper flakes, and olive oil, then tossed the drained cooked pasta in the mix to add some flavor to the pasta, then topped the pasta with the shrimp. My husband also loved it. The entire meal took less than 20 minutes from start to finish, so it was perfect for a weeknight meal. Add a salad and a baguette of crusty bread and its a complete meal for dinner guests too! PS-This Garlicky Baked Shrimp recipe was on Real Simple online and the NI is: 4 servings/242 calories/13g fat/ 24g protein/5g carb/0g fiber. Thanks Amanda! Your pasta side sounds delicious! And thank you for those nutrition facts, too! We have made this twice since I pinned this We love it !!! I want to make this but i am a HUGE fan and lover of cheese… what do you think about putting some parmesan/cheddar/mozerella cheese in this recipe? You could definitely put some grated parmesan in the breadcrumb mixture! I’m not sure if you’d be able to taste the cheese or not, though Let me know how it turns out if you try it! finally got around to making this. not only was it delicoius but it was so easy i used italian seasoning instead of parsely. had to use more butter then it called for. plus i added some cherry tomatoes to the pan when cooking. served it with spinach and cous cous. can’t wait to make it again. i definitely think you can add some parm to the panko mix. I thought about using the Italian seasoning instead of parsley after I made this I do think it gives more flavor and I’ll be doing that next time I bet the tomatoes added a nice touch of color too! What amount do you suggest, if substituting Italian seasoning for the parsley? Thank you. My general rule of thumb is the “rule of thirds”. Meaning for every 3 portions of fresh herbs, use one portion of dried. So in this circumstance, instead of 2 Tbsp of parsley, you could use approx 2 tsp of Italian seasoning. I hope you like it! What is the optional lemon for? haha I guess I should’ve included that in the directions shouldn’t I? It’s just for squeezing a little lemon juice on top when you serve it. 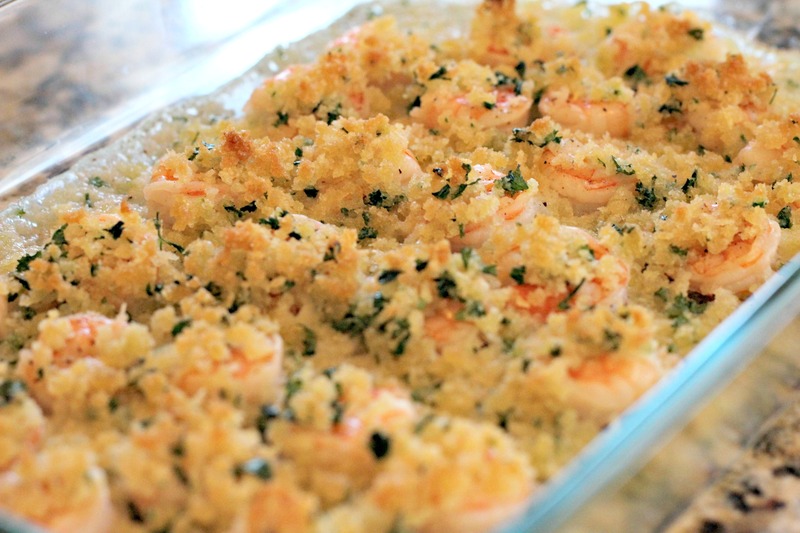 I just made this and it was soo good I let the shrimp/garlic/wine soak for awhile until baking them I also coated them with the bread crumb mixture and then added more on the top and baked I think you could also add some parmesan cheese too! I only use Panko Bread Crumbs now They never get soggy in anything you make Will make this again…thanks! Thanks Debi! So glad you liked it! Thanks for the suggestions AndI too have come to love Panko crumbs because of their perfect crunchiness! Can you freeze this after making it? If so, will it still be crispy? Well I’ve never tried that before so I really can’t say However, I don’t think it seems very freezer friendly Maybe you could freeze it without the crumb topping and just add the topping after thawing out the shrimp Let me know how it works out! Could you add scallops as well? Would it change the cooking time? Hi Jen! And yes, I think scallops would be great in this! As long as the scallops and shrimp are about the same size, it shouldn’t affect cooking time. This recipe looks amazing! I’m the designated baked stuffed shrimp cook for Christmas and I’ve got to tell you, I really hate all the work for baked stuffed This is a great option and would save soooo much time! Not sure if you’re interested in variations on the recipe, but in my baked stuffed shrimp stuffing I mix in some crushed cheese crackers (cheese nips, etc.) and it adds a nice flavor I also mix in a little grated parmesan cheese, too I would imagine the same additions would also be a nice accent for the panko this recipe calls for I’m definitely making this recipe soon! Thanks so much!! Thanks Kerri! This would definitely be a much more simple and quick dish! Next time I make this, I’m totally putting crushed up cheese nips in it Thanks for the suggestions! Wow, Lauren, thank you so much! Your comment summarizes why I started this blog :-). And trust me, I cooked NOTHING but mac n cheese just two years ago So you go girl! I’m so glad you feel inspired to cook! I have never used wine to cook with. Is it cooking wine? or will any kind of white wine work. I hate to sound stupid just not that familiar with wine. Excited to try it though! Any kind of white wine will work. I always use cooking wine, but many people will say that cooking wine is “far inferior” to using regular wine in your dishes Since we don’t drink wine, though, we choose to go with the cheaper (and still tasty) cooking wine Either one will work, so it’s up to you! Thanks for your quick reply. Just found your blog through pintrest, and I’m loving it!! Keep up the GREAT work!! Thank you so much Sheri!! The flavor added from the tails is why they leave them on, but also just an FYI a lot of Asian countries do eat the tails! Whenever I go to dinner with my friend from China, I am always shocked when she eats the tails ha. I tried this for supper tonight and it was GOOD. I made white rice where I put the shrimp on top of the rice and it was really good. People asking way too many questions. Try it and then ask questions later. Do you think I could use olive oil instead of butter? We have milk allergies in our family. I’ve never used that substitution, but I found this link: http://thepassionateolive.com/wp/baking-with-olive-oil-instead-of-butter/ which shows how much olive oil to use in place of butter I hope this helps! I made this today ~ delicious! Thanks Kate! So glad you liked it! Hi Lindsay! This looks so good and super easy! Do you have a substitution for the wine for an alcohol free version? Rice vinegar is almost the same thing so you could use that. If you don’t have that either try white grape juice or chicken broth. Hope this helps! Made this for my family and it was delicious! Awesome! So glad y’all liked it! I has been a favorite of mine for years. “Nobody eats the tails”? … I LOVE eating the tails off shrimp when they’re good and crispy! I think it would be ok The only thing to consider is that this recipe makes just enough shrimp to line the bottom of a 9×13 pan, and they’re not stacked on top of each other That way each one gets the crunchy coating on top So if you tripled it and stacked them, only the top layer would be crunchy. Or you could put them in separate dishes and do it that way. What kind of white wine did you use? could I use Italian bread crumbs? I just use cooking wine, but you can really use any white wine you like! As for the breadcrumbs, the Italian style will not stay crunchy like the panko. Rice vinegar is almost the same thing as white wine so you could use that. If you don’t have that either try white grape juice or chicken broth. As for the breadcrumbs, you really can’t substitute the panko for Italian style, The Italian breadcrumbs would not stay crunchy after baking. ooo I didn’t think about the seasoned panko! I made this tonight and it was delicious!! I was out of Panko crumbs so I used Italian breadcrumbs and didn’t add the parsley since I was out of that too 🙂 I also used precooked frozen shimp and just defrosted them It was great! I will definitely make it again using the Panko crumbs Thanks!! Made this dish Christmas Day along with Filet of Beef, twice baked potatoes, green beans and Caesar salad…YUM! only change…added 1 cup of Panko bread crumbs..
Lise, that sounds like a DELICIOUS Christmas feast! All of it sounds really good! As for the extra panko, I think it’s a good addition That buttery crunchy coating is my favorite part (in addition to how easy it is to prepare). My sister-in-law “pinned” this recipe and loved it – so she sent it to me. I, too, have a recipe blog on WordPress. It’s called My Yellow Farmhouse. I’m slowly adding recipes to it I want to congratulate you on an excellent blog – full of wonderful recipes!! Hey Cecile! Thank you for the compliment about my blog! I’m so glad you and your sister-in-law enjoyed this recipe If you would like to follow my blog, just click “follow” in the bar at the top where there is a plus sign in a circle You have to be logged in to your wordpress account to do it Then, you will see a Reader tab on your home page that has posts from the blogs you follow, including mine I’m going to go and check out your blog now! I found this on Pinterest and can’t wait to try it. As a side note, I love how gracious and patient you are with all the questions in the comments. I will make a change or two to suit my family’s tastes, but this is a fantastic start to at least a few meals in the coming weeks! Thank you for your kind words, Tina! I hope your family enjoys this dish as much as we did! Found this on Pinterest! Made it tonight for dinner and it was great!! I’m lucky enough to be able to get fresh gulf shrimp and I’m always looking for new ways to cook them. Anything with garlic in the title and you’ve got me already! I used the rice vinegar and it did fine. I ran out of the panko mix about halfway through, so I had to make up more. Other than that, it was a hit!! I am going to make this week I would also like to make that pasta you show in the 2nd picture – can you tell me recipe for the pasta? Haha sure you can! It’s called Suddenly Salad pasta salad mix…from a box. Easy right? They have lots of different kinds but I think this one is tomato pesto or something like that. In my grocery store, it’s in the salad dressing aisle. Let us know what substitutions you make and how it turns out! I think capers would be great in this! They definitely compliment the wine, garlic, and shrimp I also like that it would add a little more color to the dish. If you try it, let us know how it is! Looks awesome! Making this tomorrow night! Supposedly they leave the tails on to add flavor. Thanks Phyllis! I’ve recently heard the same thing about the tails adding flavor Maybe that’s true, but it’d have to be a noticeable difference for me to put up with them in my food! Maybe I should do a taste test and see how much better the tails-on version tastes. Always love a new good shrimp recipe! 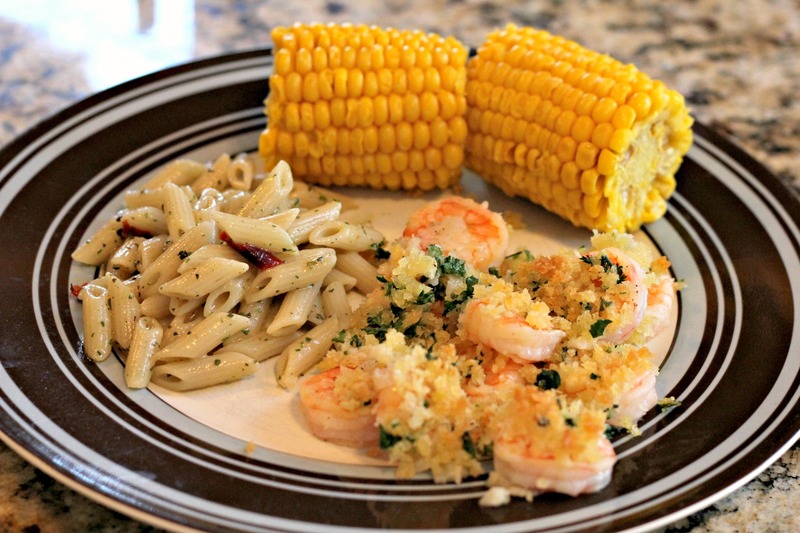 This one looks great…never tried bread crumbs with shrimp before. Can’t wait to try it this weekend! Thanks. Thank you! This is one of my new favorite ways to make shrimp because it’s SO easy! Hope you like it! Have you ever doubled it? I haven’t ever doubled it However, if you do, you might want to use 2 separate baking dishes I think layering them inside of one would make them soggy. can you substitute the white wine for anything or can I leave it out entirely? Rice vinegar is almost the same thing as white wine so you could use that. If you don’t have any, try white grape juice or chicken broth. Hope this helps! Made this last evening and it was wonderful!!! Thank you so much for a great recipe! Thank you for the comment Judi! Glad you liked it! Thanks Regina! I like the idea of using parmesan too! Do you think I could use already cooked shrimp? I’m anxious to try this for my next Bunko night! Haha thanks Sue! Glad I’m not the only one who thinks it’s weird Hope you like the dish! Ditto. If it’s got a sauce, take off the darn tails. I ate somewhere once where they were in a garlicky butter sauce and they still had the SHELL on. What a pain, lol. haha I’m so glad I’m not the only one who feels so strongly about it! I can’t wait to try this, especially now, during Lent. Tried this recipe tonight and my husband just said it is now on his top favorite meals! Easy, delicious and quick meal. I added Parmesan to the breading mix. We live very close to New Orleans, so fresh shrimp always wins out! The reasons for the tail being left on is because it makes it easier to just pick the shrimp up and eat it all in one bite. Just pinch the tail a bit until you feel the shell crack, and give the main part of the shrimp a slight tug with your teeth. It takes a bit of practice to do it right, but you end up getting the tender tail meat when you have been able to master the trick. Bon Appitite from the Bayou Country, Chere’! Cindy, I’m certainly jealous of your fresh Bayou shrimp! I don’t mind pinching off the tails when they’re served boiled just plain or by themselves But when they’re served in pasta sauce or in a salad I just don’t like having to put my fingers in my food to pull off the tails! Alas, that sweet shrimp meat is worth it, though. Have you tried this with dried parsley? If so, how much did you use? I have used dried parsley once before I didn’t actually measure it out but just kinda shook the parsley flakes on there until it looked like a good amount of green on top 🙂 Hope that helps! Yes, you do need to thaw the shrimp first. I am so excited to try this tonight! With it being Lent, new seafood recipes are always welcome Thanks! I bought frozen raw shrimp to make this one day next week. Do you thaw the shrimp before hand or do you keep it frozen? Thaw the shrimp first, and then you’ll be good to go! Made this tonight with my husband and daughter. We loved it! It was easy and we all enjoyed cooking together Can anyone tell me the calorie content? Thank you so much Corinna! I’m so glad all of you enjoyed it, and I love getting feedback from happy families! Thanks again! Following the recipe to a T, I calculated it to be 1064 calories for the entire dish using the MyFitnessPal app. It’s a super helpful app!! So since there’s 3 servings, that works out to about 350 calories each, right? Not bad! Thanks Erica! The shredded cheese is definitely something I’ll have to try! Thanks for sharing your modifications! Made this two nights ago – a real hit. Had enough left to reheat and use for an appetizer last night. Heres what I changed: Added two Tablespoons of olive oil to the wine (to which I added 1/4 C, lemon juice) and let the shrimp marinate for an hour with 1/2 the parsley and garlic. Added more parsley to the bread crumbs. Added the capers and topped all with parmesean reggiano. What a great recipe! Awesome! Thanks for the great suggestions, Gary! You could use a little olive oil. You could also try spraying some fat free spray butter on top if you’re just looking to cut out calories. I found this recipe via Pinterest. I used Italian Bread crumbs instead of Panko. It still turned out to be crunchy and delicious! Thanks for a tasty dinner! Thanks for the feedback Miranda! My family loved it, but we thought the garlic was a bit strong and we are garlic lovers. I think it is probably because I used cooked shrimp I baked the recipe about 15 minutes and I don’t think the garlic had time to cook Next time I will either cut the garlic in half or saute it first in the butter Great, easy recipe! thanks. I used the minced garlic from a jar, and it is great! It tastes just like fresh garlic (not the dried stuff), but is already minced and pre-cooked You could try that as well! Thank you so much for posting this recipe! Tried it and it was terrific! Definitely worthy of company! You’re welcome Jolene! I’m glad you liked it! Any idea of the calorie count for this? Ummm I really am not sure! The only ingredient that is highly caloric is the butter, which of course you could reduce slightly or use margarine to cut back on the calories If anybody else has counted the calories for this, it’d be great if you could share! I served this when we had guests and every single person LOVED it My husband hasn’t stopped asking me to please make it again I didn’t have panko on hand so I used Italian seasoned bread crumbs Thanks! Thanks for the feedback Leanne! made this for the first (and not last ) time tonight. it was outstanding! used 3/4 pound of shrimp for the two of us, and had a few left (my lunch tomorrow). used all of the topping ingredients. served with roasted asparagus and ciabatta rolls. husband kept saying how good it was. a keeper. Thanks for commenting Joyce! I’m so glad you and your hubby loved it! Made this for dinner tonight, used Italian breadcrumbs instead. Very yummy. Thanks for sharing. Glad you liked it! Thanks for sharing your thoughts with us! This is classic Shrimp de Jonghe which is made with sherry rather than white wine In the 1950’s we baked and served it in shells Check it on Wikipedia for the history with the Chicago de Jonghe hotel Delicious and so simple by any name. Awesome! Thanks for sharing, Susan! oooo that definitely sounds like it would kick the flavor up another notch! I made this while visiting my sister in Boston and we all loved it Now back home in St. Louis and am making it again for Father’s Day, thanks for a fantastic recipe!! Forgot to mention that I used the lemon flavored Panko and it was delicious . I made this tonight and it was fabulous. I’m a directions-follower and that’s what I did! I used dried parsley instead of fresh because that’s what I had If you love shrimp scampi, then you will love this. It’s true- it was so easy And I’m the one whose Southern Living 30-minutes meals never take less than an hour I used brand new Panko crumbs (I think that makes a difference) and larger tail-on shrimp. I paired it with rice because I thought it would need it- but it turns out the garlic/butter/crumb mixture is so rich, a crisp salad would have been more complementary My kids loved it and I’m already scheming when I can make it again Next time with friends and wine! Thanks so much for your feedback, Ashley! Great recipe! Made tonight and it satisfied my craving for shrimp scampi. Used lemon pepper panko and cilantro because I was out of parsley. It was good but will try parsley next time. Easy and delicious! Thanks for sharing. Cilantro definitely has a much stronger flavor than parsley! Glad you still liked it though! Thanks for the comment. After it’s done cooking, you can just serve it with some fresh lemon to squeeze over the dish as you please. I’m definitely going to try this as soon as I get some shrimp! I wanted to comment about something you wrote in your “About” entry. You said you don’t make up your own recipes because you don’t know anything about the chemistry of food. Well, after you’ve been cooking a while, you’ll find yourself thinking, “Hmm, I think some __________ would taste good in this.” Or “I like this OK (or I don’t like it) but would like it better without the _______.” Then one day you’ll find you’ve thawed something to cook for a recipe, only to find that you don’t have some of the ingredients you thought you did, and you’ll wing it with some different ingredients. Eventually, you will cook a LOT without looking at recipes, and you’ll be making up your own as you go. You don’t need an understanding of chemistry — once you get used to what a certain ingredient will taste like in a dish, you’re on your way! Now, for baking it is good to know a good amount of food chemistry if you want to change or make up recipes. But not for “normal” cooking! I tried this evening and the flavor was wonderful. I did not get the crispness I expected with the Panko topping but will try this again. Hubby loved it! Glad y’all enjoyed it! I’m not sure why it didn’t turn out crispy. You could try broiling it for just a minute to see if that crisps up the panko. I don’t remember how I found this post on Christmas Eve, but I had already decided on dinner and thought maybe I’d try this recipe sometime over the holidays. Well, if you haven’t noticed, it got repinned many many times that day. I finally got to try it this past weekend. Didn’t have any dry white wine, so I subbed my white zinfandel and omitted the lemon. Fabulous. I will definitely be making it again. So glad you enjoyed it! This is definitely one of my most popular pinterest pins. Can you use white wine vinegar in place of white wine? That would work fine! You could also use chicken broth. Not a problem Nancy! I think it would be totally fine to leave out the parsley as it’s not super flavorful. If you wanted to add something else for flavor, you could sprinkle some dried oregano. Thank you. Making it tonight!! Tails ‘n shells: Oh honey, if you ever find yourself face with bar-b-q shrimp IN THE SHELL, eat it all !!! At least try a small one. The shells and tiny little legs harbor a divine experience that just can’t be left for a garlic bread alone. Small to medium size are best for this. Think about it like adding fiber to your diet – LOL. This has been a favorite in my household since I’ve pinned it a year ago. We boil up a lb of linguini and a side of broccoli for a perfect, easy and delicious meal! My 9 year old loves cooking and I’ve always let her help. This is one of the meals she make make just about all on her own! Aww thanks for sharing, Nichole! I’m so glad your family has enjoyed this recipe! I think cooking really brings people and families together, and it’s so nice to know that I had a small part in that! That’s a big compliment! Glad he liked it! I am making this tonight and accidentally bought cooked shrimp. How long would you bake the dish? Oh I’ve definitely done that before. I would say maybe 7-10 minutes? Just as long as the topping gets a little crispy and everything is warmed through. What kind of pasta did you make with this dish? Looks so good! Making this tonight and my husband is super excited! It actually came from a box! It’s called Suddenly Salad, and there are several different flavors to choose from. I can’t remember which flavor this specific one is, but we have tried several and enjoyed them all! I was wondering if you could substitute the white wine for something else? White grape juice or chicken broth would substitute just fine! I had a bag of thawed frozen shrimp that I planned to use for another recipe, but had a change of plans and wanted something I could pull together quickly with ingredients I had on hand to avoid wasting the shrimp. This was perfect. Thanks Cheryl! Glad you liked it!